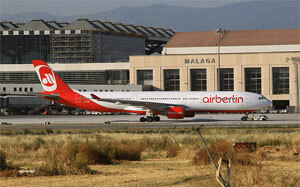 The German airline Air Berlin has scheduled to Malaga airport for this summer season a total of 56 flights a week with thirteen destinations in four European countries. Of these, fourteen planes fly every week to Palma de Mallorca, where the company has its headquarters in Spain. The airline puts on the market this summer nearly 600,000 seats connections to the capital of the Costa del Sol, representing a decrease of 80,000 seats, which was justified in the decrease of the tour operator in the destination. Among the novelties is the new flight from Malaga via Palma de Mallorca to Friedrichshafen, the capital of Bodensee district in southern Germany, which will be available twice weekly (every Tuesday and Thursday), starting next Saturday. There are also available flights to five airports in the Iberian Peninsula (Alicante, Barcelona, Bilbao, Madrid and Valencia), as well as Palma de Mallorca and the Portuguese city of Faro, all via Palma de Mallorca. Another novelty is the connection to St. Petersburg via Berlin.